I lost an earring. This should not be a biggie as I have other sets. 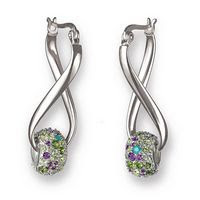 However, this pair is quite special as it is a pair of loop earrings. Currently, I am more adapted to loop earrings as stud earrings have the tendency to fall-off from my right lobe - too-big-an-ear hole!. Anyway, traditional loop earrings are "boring". Surely there is another style that would suit my needs? There is! I saw this pair of earrings from chamilia designs. I love it! I want a pair...now! I also like the pair of earings..Maybe that will be the replacement of your old earing. WIlliam and Kate Wedding Kiss!